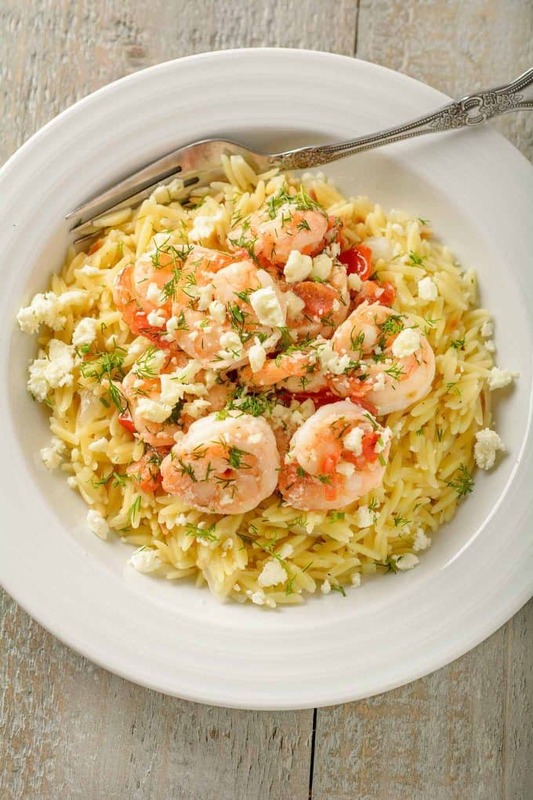 Succulent sautéed shrimp served atop a bed of orzo makes a satisfying one-dish meal that’s both versatile and easy to make. This recipe can be made with two different flavor profiles! 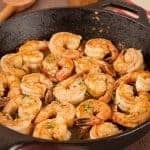 One is a garlicky, buttery version similar to shrimp scampi. This is the one that’s pictured above. The other is a delicious Greek-style version with feta cheese, fresh dill and tomatoes (see the two photos below). No matter which version we’re making, we always prepare our orzo “risotto-style.” Using this method, orzo develops a light, creamy consistency similar to conventional risotto, and it’s perfect for pairing with a quick-cooking protein like shrimp. The basics for making either version of this dish are the same. Start by tossing the shrimp with some garlic, olive oil, salt and pepper and setting it aside while you prepare the orzo. Next, sauté chopped onion in olive oil for a couple of minutes, then add the dry orzo and cook until it’s lightly toasted. This step only takes a minute or two, yet it adds a nice depth of flavor. Before you add the cooking liquid, stir in some minced garlic, cook until fragrant and deglaze with a little white wine. To add even more flavor, we always use low-sodium chicken broth for cooking the orzo. Stir a few cups into the orzo, cover and cook until the liquid is absorbed. Then you add more broth in small quantities until the orzo is done to your liking. 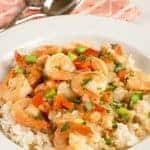 This technique is similar to the way you prepare authentic risotto. 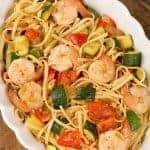 To save on dishes, once the orzo is done, we transfer it to serving plates, quickly wipe out the pan, and sauté the shrimp over medium high heat. 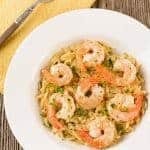 The shrimp only take a couple of minutes to cook, so as long as you have your finishing ingredients ready to go, the orzo shouldn’t get cold. 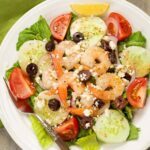 The Greek-style version of this recipe combines fresh dill, chopped tomatoes, lemon and crumbled feta cheese with the garlicky sautéed shrimp. The saltiness of the feta and the bright flavor of the dill lend a completely different flavor profile to the recipe. An unoaked Chardonnay or Pinot Gris will work nicely with either version of this recipe. For beer lovers, you might want to try a Pilsner. 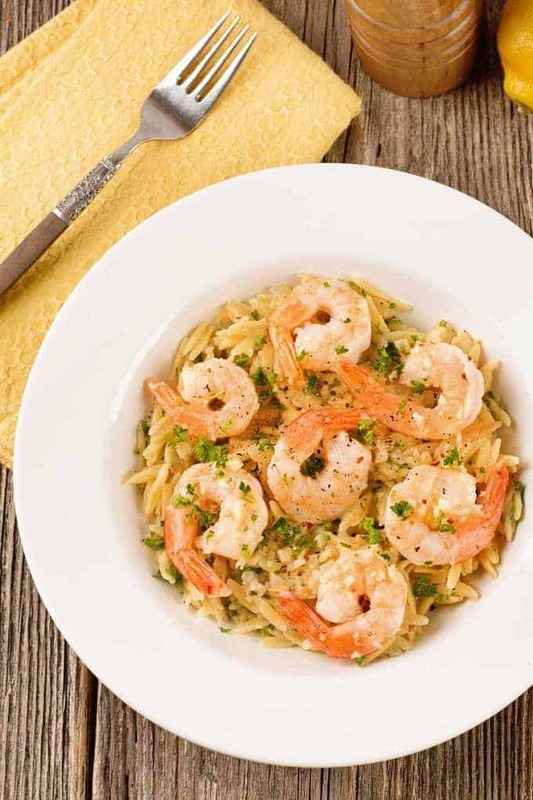 Serve garlicky sautéed shrimp over a bed of creamy orzo prepared risotto-style to make an elegant, flavorful dish that’s simple enough for a mid-week meal. Place the shrimp in a shallow bowl and drizzle with 3 tablespoons of the olive oil. Add about 2/3 of the minced garlic, season lightly with salt and pepper and combine well. Set aside while you cook the orzo. Heat the remaining 2 tablespoons of olive oil in a sauté pan over medium heat. Add the onion, season with salt and pepper and sauté until soft and translucent, 5 to 6 minutes. Add the dry orzo and stir to coat with the oil. Continue cooking for 2 to 3 minutes, stirring frequently, then add the remaining garlic and cook until fragrant, 1 minute more. Deglaze the pan with the wine, scraping up any browned bits that have accumulated on the bottom of the pan. Stir in 3 cups of the chicken broth, cover the pan and reduce the heat slightly. Cook, stirring occasionally, until the broth has been absorbed, 5 to 7 minutes. Continue adding broth, 1/4 cup at a time, until the orzo is cooked to your liking. Stir constantly at this point and let each addition of broth absorb completely before adding more. Once the orzo is cooked, stir in 2 tablespoons of the lemon juice and season to taste with salt and pepper. Plate individual servings of the orzo and set aside while you cook the shrimp. Working quickly, wipe out the pan and return it to the stove over medium-high heat. Add the shrimp mixture and sauté until pink and opaque, 1-1/2 to 2 minutes. Tip: Use a rubber spatula to transfer the shrimp to the pan so you get all of the oil and garlic marinade. To finish the Garlic-Butter Shrimp: Add the butter, parsley and remaining 2 tablespoons of lemon juice to the pan. Cook just long enough to combine well and melt the butter. 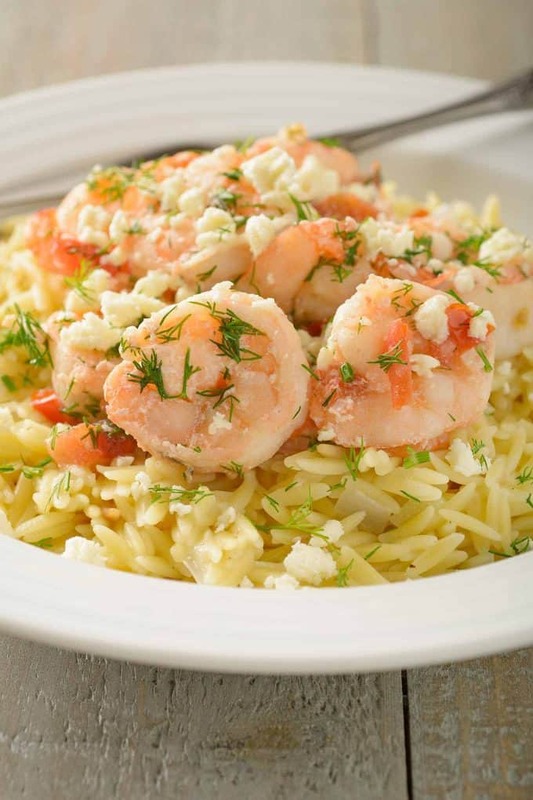 Divide the shrimp between the plates of orzo, spoon the pan juices on top and serve immediately. To finish the Greek-Style Feta and Dill Shrimp: Add the butter to the shrimp and as soon as it melts, add the diced tomatoes, dill and remaining 2 tablespoons of lemon juice. Combine well, then divide the shrimp between the plates of orzo. Spoon the pan juices on top, sprinkle with crumbled feta cheese and serve immediately.